Unable to bring Mitsuki back with them, Boruto, who sustained injuries, retreats with Sarada, Shikadai and the others, and takes cover. However, being close to the borders of other countries means that they may be attacked at any moment. For safety, Inojin and Chocho decide to investigate their surroundings. During that time, Inojin becomes attached to a strange being that is “born” of the earth. 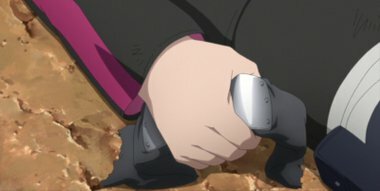 Around that time, the unconscious Boruto witnesses a dream in his hazy stupor.